Meet the Pantry Manager at The Cupboard in Davie, Fl. Help the Pantry Manager to choose the best available items. Making sure food safety standards are respected. No need to use personal vehicle. Flexibility during Holidays - Pick up days are subject to change accordingly. 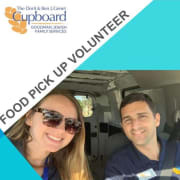 With the support of the Food Pick Up Volunteer we are able to provide food groceries to 500+ families within Broward County, on a monthly basis. The DBJG Cupboard is the largest kosher food pantry to help eliminate hunger in the Jewish community. The Organization solicits, collects, provides and, whenever necessary, delivers food directly to, and in conjunction with, all the agencies in Broward that service this diverse population. Our whole-person approach starts with food provision through the distribution of nutritious kosher food that our clients can choose in our choice market layout. Please send your request NOW and be part of the solution!